Merry Christmas! Whether you celebrate the holiday or not, you can enjoy the events in Ship of Heroes. After listening to our website polls and forums, we think we can make a great start by having Halloween, Christmas, and Ship Launch Day (July 4th) as our first set of holiday events. 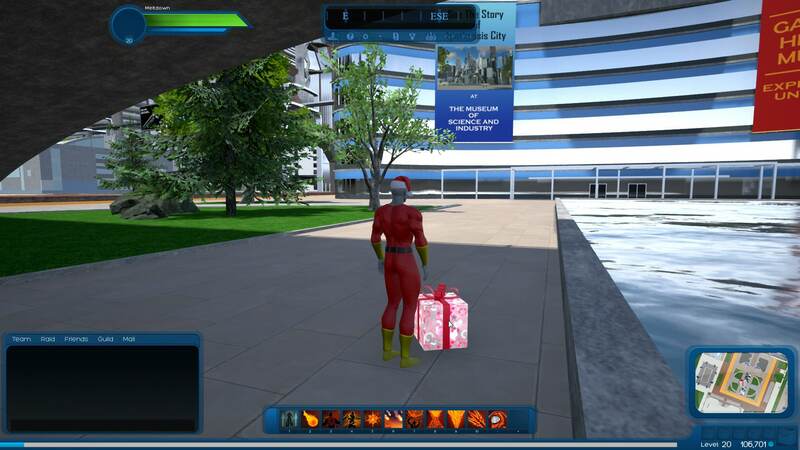 In this video, we’re showing our first in-game holiday event: Meltdown is collecting Christmas gifts by racing around Apotheosis City. As he finds each one, he opens it and receives both in-game money (Dust), and a gift that goes into his inventory. We’re also showing picture-in-picture clips of the most important milestones SoH has achieved in each of the last twelve months. Through the PiP, we are sharing an overall tale of success, of moving from a website with a bit of concept art and story, to our current working game prototype. In addition to celebrating the holiday season with you, our community, we are also asking for your support. We’re a small team, mostly self-funded and staffed by volunteers, and we’ve accomplished a lot this year. By the end of next year we plan to be launching an open Beta. But we need your support to reach that goal. So we are appealing for the first time to our base of supporters – that’s you, and the other individuals who receive this newsletter – to make whatever contribution you can manage. All of your contributions go straight into the funds we use to develop Ship of Heroes, speeding up development. We hope you can donate something to the cause. 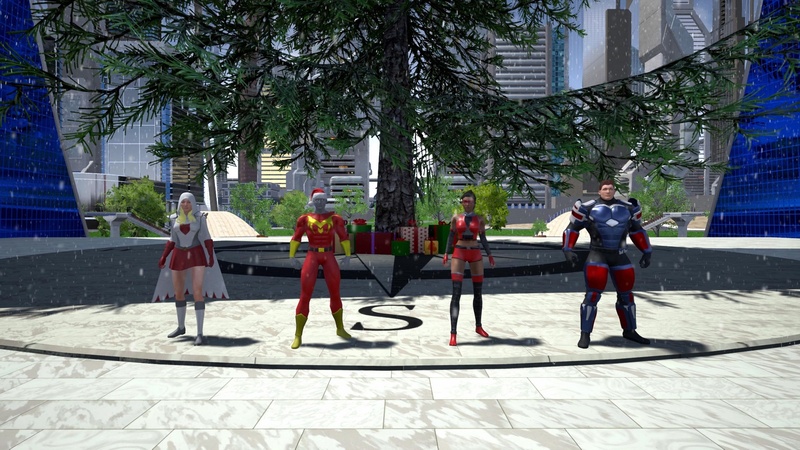 This is the first in-game reveal of a holiday event for Ship of Heroes, although we celebrated Halloween with a holiday-themed video and powerset. As each present is opened, signature hero Meltdown receives money and/or a gift reward. The devs intend for this to become one mechanic for larger future holiday events. Note that Meltdown’s total Dust is increased each time he opens a present. The locations of the glowing gifts in the video should not necessarily be taken to be those in which gifts will be found when the game launches – though a couple of these spots are now favorites of the dev team, so you might want to remember them for the future. It is our intention to allow players who gather presents during in-game events to also receive gifts such as one-use pets and powers that can be saved for later use, including after the holiday event has passed. We have not yet decided whether we will allow these gifts to be sold or not. We’re using picture in picture (PiP) to illustrate the year of progress that the game has experienced. 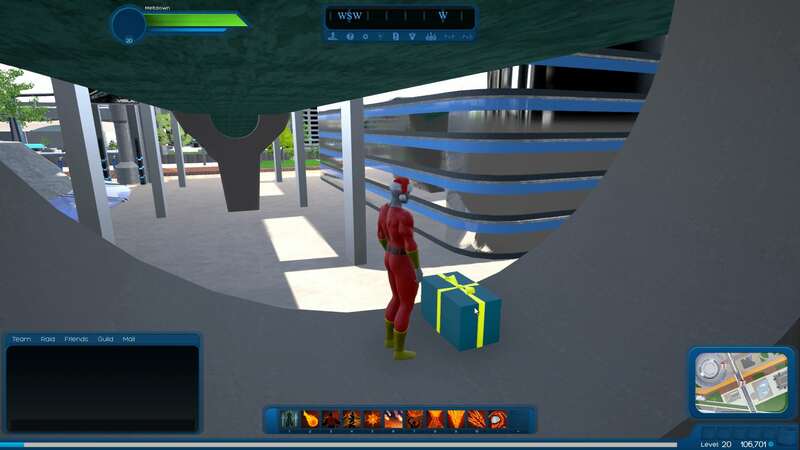 As each present is opened, a PiP clip opens showing one of the key events of the past twelve months of game development. 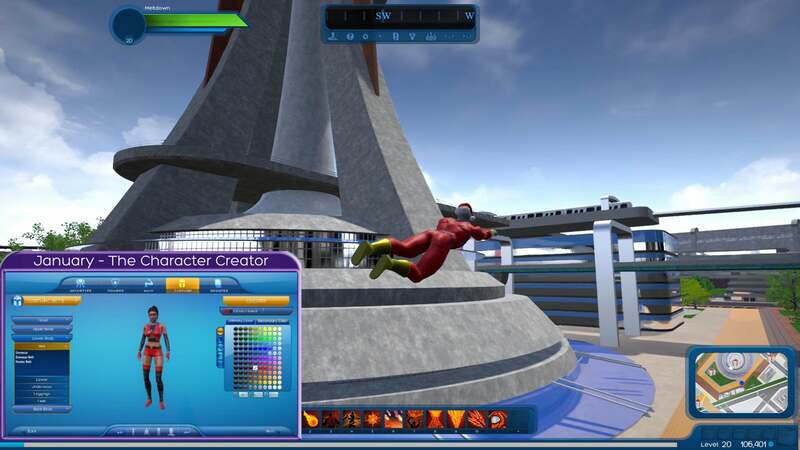 Ship of Heroes was nothing more than a website with concept art in December of 2016. One year later, the game is well on the way to being launched. We recorded the video in a packaged version of the game, as we usually do. The snow in the final scene is a post-processing effect, and does not indicate any plan to launch the game with weather effects like snow or rain. For clarity, Ship Launch Day is anticipated to be July 4th. This is not the anticipated launch date of the game, but rather the in-game historical date of the launch of the Justice from Earth. For those wondering why we did not decorate the Christmas tree in the final scene… we simply ran out of time. We have a big December planned, and we want to build the game as quickly as possible. The next major event on our milestone schedule for 2017 is a small-scale alpha test of the combat system of SoH, planned for late December.